Oven Baked Eggs Hotel Eggs turn out so light, fluffy and gorgeous they’re my go-to method whenever I have a crowd. Super easy to make, they’re far easier than standing at the stove and, frankly, turn out better. Every time. Oven Baked “Hotel” Eggs – easy and perfectly light and fluffy! I’ve made Oven Baked Eggs Hotel Eggs using a dozen eggs, and in a smaller 8 x 8″ casserole, a half dozen. If a smaller pan is used and timing is watched carefully, I don’t see why it couldn’t be used for fewer, and if you want to make a larger amount, something like a lasagna pan (or maybe two pans) would work well. If you have leftover eggs, consider using them the next day in breakfast burritos, like my Green Chili Breakfast Burritos, sandwiches or wraps – the eggs won’t be at the absolute peak of perfection but they’ll still blow away any fast food eggs! Use any milk or half and half or a combination. For creamier scrambled eggs, try adding small cubes of cream cheese or dollops of cottage cheese before cooking. If you add less dairy, they’ll cook faster, but won’t be quite as rich and creamy. Add-ins like onion, peppers, etc. are best cooked first and added into the eggs during the final “stir.” Cook them ahead to make your morning easier. Meats like ham, chorizo, sausage, etc. should be precooked and added during the final “stir.” Cook them ahead to make your morning easier. Cheese is best sprinkled over the top when it comes out of the oven. Let it sit for about 30 seconds then fold in. Add flavor with pesto, salsa, ranchero sauce or fresh herbs when serving. Check out the bottom of the post, where I’ve added some fun links to other breakfasty type dishes & favorite condiments to use with eggs. Servings are going to depend on how many eggs your people will eat, so you’ll need to judge for yourself based on their appetites. This is a nice recipe because you can make it as lean or as rich as you’d like and as many or as few eggs as you’d like. Make it your own (and make sure to print the recipe or have the link ready, because everyone will want it after they taste these!) I’d love it if you stopped back and let me know how you like these and what your special variation is! Oven Baked “Hotel” Eggs – remove when no liquid remains, they continue to cook for a minute or two. 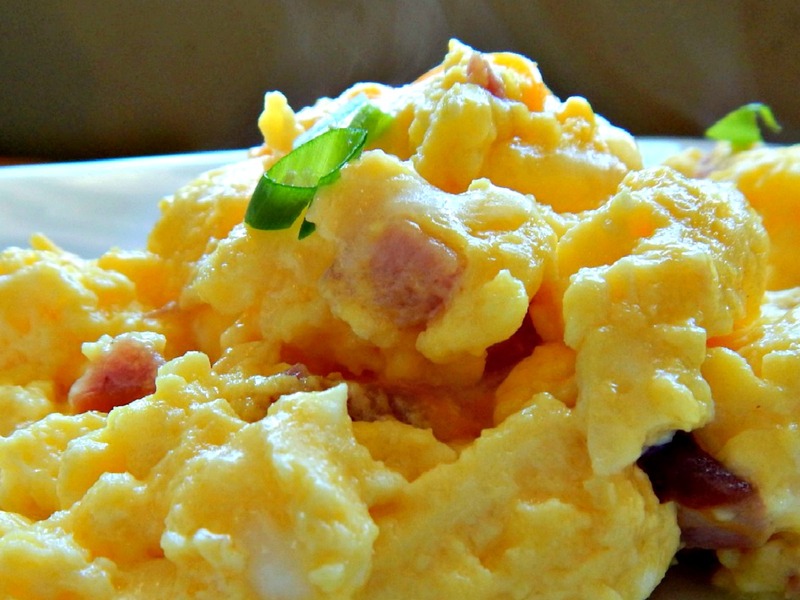 Oven Baked “Hotel” Eggs – probably the best scrambled eggs you’ll ever have! Mix eggs, dairy, salt, and pepper in a bowl until blended. Heavy whisking will result in lighter, fluffier eggs, less whisking will produce a denser egg. Add butter to a 13 x 9″ pan or equivalent size casserole, turning casserole to coat sides. Pour the eggs into the center and bake until the eggs begin to set, 8 to 12 minutes. Leaving the pan in the oven, so as to retain as much heat as possible, pull out the rack just enough to reach the eggs with a spatula. Using a spatula, quickly but gently PUSH and PULL the eggs from the bottom and sides, forming large, soft curds. Push rack back and continue to cook. Repeat the pulling and pushing a time or two more until eggs are thickened and no visible liquid remains. The eggs should appear very moist but will continue to cook from the heat of the pan. If you leave the pan in the oven until the eggs look “done,” they will be overcooked. The process will take about 20 to 25 minutes. A kind pinterest reviewer mentioned 18 eggs in a 9×13″ pan took about 45 minutes; they would likely cook faster in a pan that’s a bit larger, if you have one, like a lasagne pan. This entry was posted in Click here for Bargain Meals, Click here for Fabulous Food Posts and tagged Breakfast or Brunch Dish, Cheese, Cream, Cream Cheese, Eggs, Half & Half, scrambled eggs. Bookmark the permalink. wow – this is amazing, most practical blog. You should consider compile them in a book. Has anyone double the recipe and if so how long did the time increase (from the original recipe of 25 min) Thank you! Erin, I haven’t doubled the recipe, one reader right below said she did 18 and it took way longer, like an hour. I was going to try that coz we had a BIG house of company, but everyone took over the cooking – I would use a big pan, like a 9 x 13, or if you have it a large lasagne pan or big cake pan so the eggs remain in a very shallow layer. It seems strange to me that 18 eggs would take an hour so I can only wonder if a deeper pan was used – I didn’t hear back from the commenter. Maybe you could just use two pans? I made these for a brunch for 10 people since this was way easier than tending to eggs over the stove. Only thing i will say is this took WAY longer than 20-25 minutes – more like an hour +. I made it with 18 eggs but I can’t imagine 6 eggs would more than double the time. And I didn’t even use any add-ins. Ended up having to turn the oven up to 400 to finish them. I think next time I’ll try them at 400 degrees from the beginning. I hate eggs so I can’t say how these tasted but they looked very fluffy and everyone else liked them. I have never tried that many, I think it would increase the time, but that’s a HUGE difference. I wonder what pan you used? If wasn’t very big and the eggs were pretty deep that might add on time, too. I used to hate eggs, too. From my pregnancy on, coz I couldn’t keep anything down. But I do love these and I’m glad everyone loved them, although it sounds a like it was probably stressful waiting for them to be done while everyone is waiting on breakfast. So good to know because we’re having a houseful later in the week and I was planning on making them. Thanks for letting me know! I made these yesterday. I used two dozen eggs in a glass pyrex type baking dish. It’s the same dish I use for lasagna and I think it would hold two box cake mixes, although I’ve never tried that. The dish measures about 10×14″. They cooked beautifully in about 25-30 minutes. Once they get started cooking, it goes fast. This is probably the third time I’ve made them, but the first time with two dozen eggs. The family loves them. Hi Kathleen – that’s so good to know about the lasagna pan (thet’s what I call my large pan) because there are times when you do have a good sized crowd and ppl with good sized appetites. I know my son could scarf down a half a dozen eggs by himself! I’m so glad you tried it with the two dozen! Happy Holidays!! Mollie, little man and I just made a tester batch of these for brinner. They are wonderful! We will be making a big batch for my sister’s bridal shower brunch next week. I was worried about how I was going to get the eggs done, now I can wipe that worry away! Oh I’m so glad you liked them! But wow, at a shower – have you thought about a strata?!!? Hey I have a dumb question. Is it 12 eggs for an 8X8 pan and 24 eggs for a 9X13 pan? Thanks! Actually, that’s a great question and I should have thought about it. I usually use my casserole shown that has high sides, and cook a dozen and that’s about the equivalent of an 8 x 8. If I were doing two dozen I’d go for a 9 x 13! Thanks for pointing this out! Not a dumb question! 😊 The recipe does indicate 12 eggs for 8″x8″, but I usually use an 8×12 pan for 12 eggs, and about 15 eggs for a 9×13. The number of eggs is very flexible ; just watch it carefully and don’t let it get too set before you start pushing the eggs to the center. The eggs look perfect and a great idea. Love it!! I recently found your recipe on Pinterest and decided to make them for 4th of July brunch for my family. Wow- what a hit! Everyone loved them, and we couldn’t believe how fluffy and creamy they were. And the best part? I didn’t end up burning my eggs in a pan while trying to multi-task and prepare my side dishes. Thank you!!! Thanks Linda! I love hearing feedback! 🙂 🙂 A Happy (and safe) Fourth to you and yours!! Found this recipe on Pinterest just before we left for our beach vacation. With 12 of us in the house, I needed something easy-ish that sounded promising in its taste. (You had me at “hotel eggs”!) I doubled the recipe, and the eggs were fantastic! I rarely get compliments on my cooking, but there were big smiles around the table, folks refilling their plates, and even a request for the recipe. THANK YOU for sharing! I made it again yesterday without doubling the recipe – and it was just as wonderful. The 4 of us polished it off in one sitting! THIS IS A KEEPER! Thank you Paz! It amazes me how the same basic ingredients can come out so differently with different methods. 🙂 These are truly a fave! I just ordered a Cuisinart mini oven that has an 8 X 8 insert. This looks like a perfect recipe to try it out. The breakfast burrito is an excellent way to serve them. Hi Judilyn – sorry to take so long to reply, but that would be perfect to bake these in. I love my little cuisinart griddle/grill combo! Hi Mollie– I am totally making these they next time the kids are all in for the weekend. I usually have eggs on the stove and usually scorch them while I’m turning pancakes and pouring syrup for grand girls! This looks like a brilliant idea. thanks! Made these for our Breakfast for Dinner Bunco game last night! Delicious! Eggs were so fluffy! I added chopped ham, cheddar and sliced scallions during the last “stir”. It was a hit! I will definitely be making these again for my next brunch. So much easier and neater than cooking on the stove. Thank you!! Elana, thank you so much for taking the time to stop by and comment! 🙂 I’m glad they were a hit, and I have to say I love the theme of your Bunco party! Could this be done for someone dairy free? Katie, I haven’t tried it but I don’t see why not! This I how we do them at the Nursing Home I work in. Lucky people to have such good food! 🙂 Have you tried it at home? This seems time intensive. Not saving. So much opening and closing the oven and stirring. Wouldn’t it be easier just to scramble them on the stove? I mean you could have eggs in 5 min. rather than 30. Well it does take a bit of time which could be shortened by adding less liquid, but what you gain are the best scrambled eggs ever! They really are superb. And I don’t know about you but if I’m making a dozen eggs on the stovetop it does take some babysitting – and not everyone has a great pan to pull off a dozen eggs on the stovetop. It just all depends on whether or not you think it’s worthwhile I guess. Exactly. This is not everyday eggs, but more of a special casserole, in my opinion. I could never get the same consistency using a stove top pan, and I am very familiar with making the usual scrambled eggs. Just try it one time and see what you think. (And you really don’t have to open the oven more than once or twice). Thanks for the recipe, I am making a New Years Day brunch this week, I will be using chafing dishes for most of the items. I was going to eleminate plan eggs because I wasn’t sure how they would keep. What do you think about “under cooking” these just a tad, and then transfer to a warming dish. Hi Carmen, I think that is exactly how they probably do it at those big buffets in restaurants and hotels. I haven’t tried it, though, myself. I do always take them out slightly underbaked as they continue to cook for a minute or two. Huh, interesting, I have never thought of baking scrambled eggs. I don’t know that I would ever have an occasion to make that many eggs, but it is good to know. Very interesting. Thanks – they’re so good that sometimes I contrive to make them and invite enough people over for a late brunch…I’ve been down in SD at my parents and I’m waiting for the holidays and my siblings and their kids to visit so we’ll have a crowd. This is such a great idea. I usually end up standing over a stove (and I don’t even eat the finished product!). I am trying this next brunch. Thank you. Thanks for stopping by and commenting – I think you (and your guests) will love them. Hi! I’m not really good at cutting recipes in half or thirds Lol if I wanted to make a single serving, as I am often eating alone (stay at home mom) what would the measurements be? I think it would be pretty straightforward to cut in 1/2, 1 tablespoon butter, six eggs, 1/2 cup milk plus about a tablespoon (the exact measurement of the milk isn’t an issue) 1/4 teaspoon salt. If going smaller, say 3 eggs, I’d still use the tablespoon butter 1/4 milk and a few shakes of salt. The problem you will probably run into is timing – a smaller amount will cook very quickly and part of what makes this recipe so good is that the eggs really cook low and slow in the oven. You’d have to watch it like a hawk to figure your timing out the first time you make them. You might also want to turn the oven down just a hair, to 325 degrees. I’d be curious to find out how they turn out for you – I guess they’re just eggs, after all, although very good ones, so not too much to worry about! 🙂 Good luck! Hey girl! OK I did it! I used 4 eggs, 2 tbspn of eggs, 1/3 c of milk, salt and pepper (eyeballed) and cooked with green onions, julienne sliced ham and mild cheddar on 325 for about 25-30 min coming back to mix every 5-7 min. Came out great!!! I wanted to post a pic but not sure how Lol thank you for your reply! Good for you! Now maybe I’ll try it, haha! I don’t think the comment sections here will allow a photo, but it sure sounds good! 🙂 I love that you checked back!! I’ve been making something very similar to this for years, but I do add real bacon bits on the bottom and a very generous layer of sharp cheddar cheese; then I pour the whisked eggs and cream combo on top (yes, whipping cream tastes best but I often use half & half). Thank you for explaining the differences in the texture when adding cheese ~ and for explaining the “stirring method” which is not stirring at all, is it? 🙂 I usually say something very similar when trying to explain (“you sorta *push* the more done eggs to the center”). I only use 15 eggs in a 9×13 pan but I’m going to try 24 eggs, which is what doubling your recipe would call for. I find if I’m very careful to not overcook but I do push them enough, they do come out pretty fluffy, and SO good! Thank you for this great recipe & explanation. Hi, thanks so much for the great comments and variations. I thought it was interesting that you add the bacon/cheese at the beginning and I usually add it in at the end. I think I’ve been afraid to try them at the beginning. I absolutely agree the richer dairy is the best tasting but I have yet to try them with full cream – but I know at my age I have to watch that a bit – I had such a long lecture from my doc last visit I felt like maybe I had a negative life expectancy and I may have actually died 20 years ago…LOL! That’s such a great idea with baking eggs. I will be trying this in the future. Thanks for sharing. Also, thanks for checking out my post. My pleasure! It’s always fun to stop by and see what you’re cooking up! Same here. Thanks for your kind words. Cheers! We often have overnight company as well so I am going to try this method. Thank you so much for this recipe and your tips! I love this post! When I have a crowd over for breakfast or brunch I’m always looking for a way to serve delicious food and be able to enjoy it with my guests. Plus, your money saving tips are amazing! Thanks! I wish I would have known this when I was a youngster – it’s so much easier to get them perfect! I love this idea and they look very moist! I am always looking for ideas for breakfast and brunch. Pinning! You can’t get a higher compliment than that!